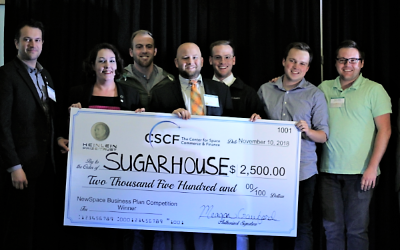 The Center for Space Commerce and Finance (CSCF) is excited to announce the finalists for the NewSpace Business Plan Competition. This event will be held on November 9th in Austin, TX in partnership with the 2018 New Worlds Conference. 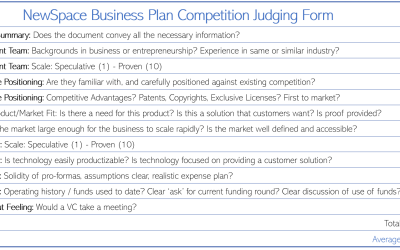 Competitors will participate in a half-day bootcamp on November 8th to prepare themselves to present to a panel of top-tier space investors the following morning. The winner will be announced in the evening of November 9th. Thanks to generous sponsors like Heinlein Prize Trust, SSL, and many more, we will be awarding $2,500 to the winner of the competition and a $1,000 Audience Choice award. Froberg Aerospace is a developer and provider of small satellite propulsion technologies that offer small satellite developers never before realized capabilities in terms of mission flexibility, rapid concept-to-orbit, and the ability to change satellite mission requirements on-the-fly. Slooh is the only virtual space lab for the classroom that gives teachers and their students the ability to remotely control a global network of live telescopes. Space in Africa covers the business, technology, discoveries, events and political news about the African space and satellite industry. 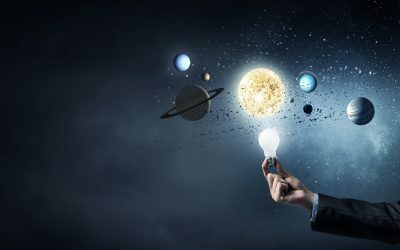 SpaceBridge Logistics is building a marketplace for in-space services at the intersection of aerospace and blockchain. SpaceBridge is coupling a blockchain-powered space asset registry for ownership attestation with a decentralized marketplace for purchasing space tug services (e.g. Uber for Space). Building a bridge to the final frontier through simpler satellite servicing: SpaceBridge Logistics. Sugarhouse Aerospace provides affordable access to suborbital space, helping consumers, educators, and researchers explore the final frontier and study its unique environment. Launch Vehicle and Space Systems Company. Specializing in reusable oceanic launch vehicles. Suborbital/ Exoatmospheric Sounding Rockets. Space Commerce. Launch Services. Engineering Consultation.